I’m playing around with different gluten-free mixes and wanted to check out another from 1-2-3 Gluten Free (I reviewed their Pan Bar Mix). So I’m testing their “Roll-out & Cut Sugar Cookies”, which are free of gluten, wheat, dairy, caseins, peanuts, tree-nuts, corn, egg and soy! The mix does contain sugar, so be careful if you’re diabetic, hypoglycemic, or generally avoid white sugar. Other than that, it’s a basic mix of rice flour, tapioca flour, potato starch and the necessary xantham gum and baking powder. To make it extra special for my gluten-dairy-free-British colleague Dale I added adding some delicate dried lavender to make a tea-tasty cookie. I had attempted to bake the cookies two different ways – first by rolling and cutting out as the mix suggests, then by rolling the dough with my hands into a ball and pressing flat, crisscrossing with a fork (with the intention to see if this may make a suitable snickerdoodle dough). But my dough was too dry to roll out, and crumbled on my pastry board. So I rolled about 1 tablespoon of dough with my hands and flattened it a tiny bit, placing 12 cookies about 2 inches apart on a thin baking sheet. The result: Well, these cookies are very sweet to me. But I like my pastries just-sweet, so this is probably good news for other bakers out there. They do taste remarkably close to regular sugar cookies, even despite the lack of butter. Mine are much thicker than what this recipe is intended for (rolling them thin and cutting them can make 40-100 cookies, my batch yielded 36), but the texture is great – soft and slightly crumbly. The essence of lavender is perfect (I’d say 1/4 cup or less…). Overall, I’m a little disappointed I couldn’t roll them out, but think it’s a great standard cookie mix. And they’d make a great snickerdoodle by adding 2 teaspoons of cinnamon to the mix and rolling in cinnamon before baking. Add 1/2 cup of the flour mixture and blend thoroughly. Add the rest of the flour mixture and beat until incorporated, scraping down the sides of the bowl, until you can make a solid dough-ball. Occasionally, very occasionally, I indulge myself in a boxed mix of something gluten-free. One night during a run of a play in Cincinnati I was CRAVING something sweet and stuck in the theatre all day without so much as applesauce to appease the pangs. Later that night during my 11pm run to the grocery store, a box of 1-2-3 Gluten Free “Pan Bars” just happened to end up in my cart… oops! The next morning, before another two-show day, I whipped the mix together with a few eggs and oil, and the 3/4 a cup of pumpkin that the box recommended. Not to succumb completely to a packaged product, I spiced it up à la Dusty Baker with some cinnamon and freshly grated ginger. Spread into a 9×11 pan, popped into the oven for a half hour, cooled for another half, sliced and covered and it was on its way to hungry actors and stage crew. Now a good amount of actors are foodies – I’ve never met such a quantity of people through a profession who share my obsession with Saveur magazine and who sympathize with my insane desire to own my own chickens enough to send me email links to urban “hen houses” (I WILL have my own eggs from the happy hens who live on my roof in my future apartment in New York City… that I will own…near my Dusty Bakery). So I decided to see if there would be any adverse reaction to NOT telling people that they were gluten-free. I set the pan out, headed to my little dressing room and waited. Voices inquired about what they were, cursed me for bringing in another baked goods (actors are obviously always watching their waistline – which is why most things I bring in are relatively healthy anyway! ), and then hailed them for their deliciousness! And when I tried them, I wholeheartedly agreed! 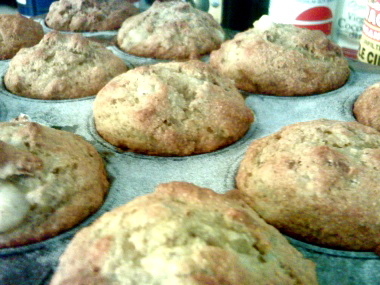 They were moist, light and fluffy. And one particular friend, who had said he wasn’t interested in any way in trying something gluten-free, declared them delicious and stuck to his opinion after I unveiled my bit of trickery. Score for the gluten-free-ers! I was also thrilled to tell the group that the boxed flour was delightfully simple – which is why I gave in and bought it to begin with (most boxed mixes have WAY too much stuff in them for me). So the only things I would have changed if making this from scratch myself was the white sugar and the potato starch (I would have experimented with tapioca starch or arrowroot to exclude any trace of nightshade vegetable). And the ingredients are free from gluten, wheat, dairy, casein, peanut, tree nut, corn, egg and soy! The recipe could easily be made with applesauce, carrot or zucchini instead of pumpkin, and chickpeas instead of eggs to make egg-free (there’s a recipe for this on the inside of the box). So, needless to say, I am VERY supportive of this brand from my one experience. 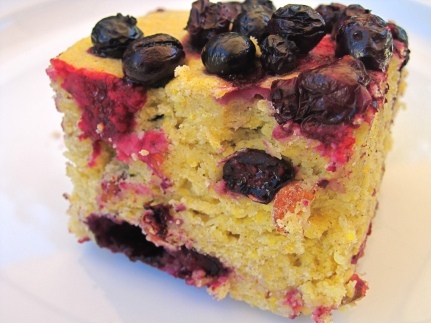 The blend doesn’t contain too much sugar or additives, and produces a light and fluffy cake. I was extra excited to learn that this company hails out of Cleveland – only a few hours from where I’m typing right now! Thanks, Kimberlee, for this wonderful product! ﻿…﻿That is, unless you’re allergic to chocolate. This afternoon your Dusty Baker got on the subway with four bags and a good book. About 30 minutes later I realized I was express-ing my way past any station I could transfer at and was headed to the Bronx. 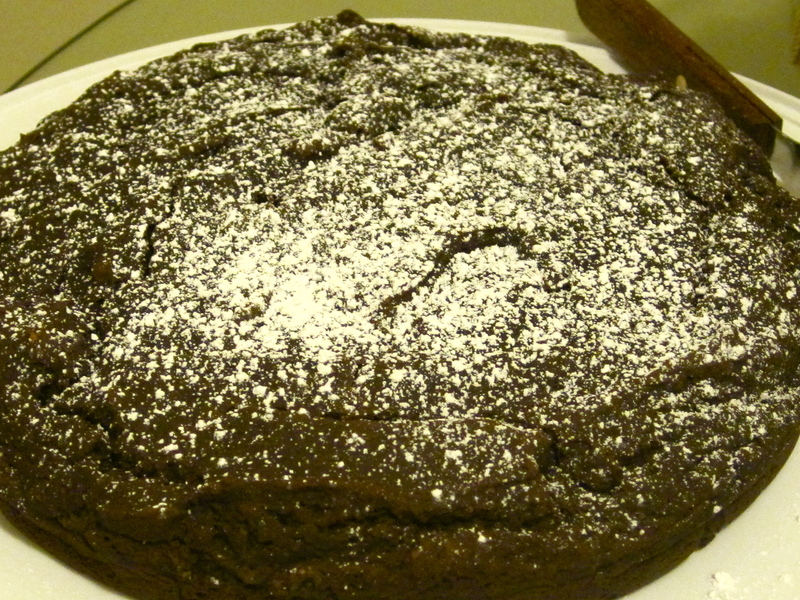 It was a long trip home to making this chocolate cake, I tell ya. Luckily, the book was really good and I’m NYC savy enough to figure out a way to not go the 100 blocks back in the opposite direction to transfer, but rather did a little schlepping and got my ingredients home. A can of organic pumpkin and a box of gluten-free chocolate cake mix from Gluten-Free Dreams, to be exact. I read on a vegan blog that you can substitute the oil and eggs in a cake recipe with a can of pumpkin. Why not throw this into the mix of my boxed gluten-free cake mix experimentation? As with the Betty Crocker and Glutino mixes I used last week, this mix from Cherrybrook Kitchen is made primarily with rice flour, potato starch, sugar and xantham gum. Not my personal favorite mix of ingredients. Allergy-free, yes. Healthy alternatives, not really. But I remind myself of the purpose of the experiment – is baking gluten/allergy-free now just as easy as traditional recipes? – and soldier on. Into the bowl goes one box of allergy-free chocolate cake mix, one can of organic pumpkin and two teaspoons of vanilla extract. I mix until everything is absorbed, and then throw in 1/4 cup unsweetened vanilla almond milk (if you’re allergic to nuts, obviously substitute with cow, soy or rice milk). The mix is thicker than a traditional cake batter, but with confidence I lump it into a 9″ greased cake pan and into the 350 degree preheated oven. 29 minutes later, the toothpick comes out clean. 15 minutes later, it’s successfully flipped over and onto my carrying plate. I’ll let you know what the peanut-eating-gallery thinks. I’m bringing a vegan chocolate cake to a dinner party tonight, And to go along with a cake, one needs a frosting or a sauce, right? Last weekend I made a gluten-free chocolate/vanilla layercake with a traditional buttercream frosting for a friend’s birthday. It was way sweet, and full of, obviously, butter. And since the cake was vegan, logic follows that I shouldn’t just dump some animal by-product frosting on top, right? 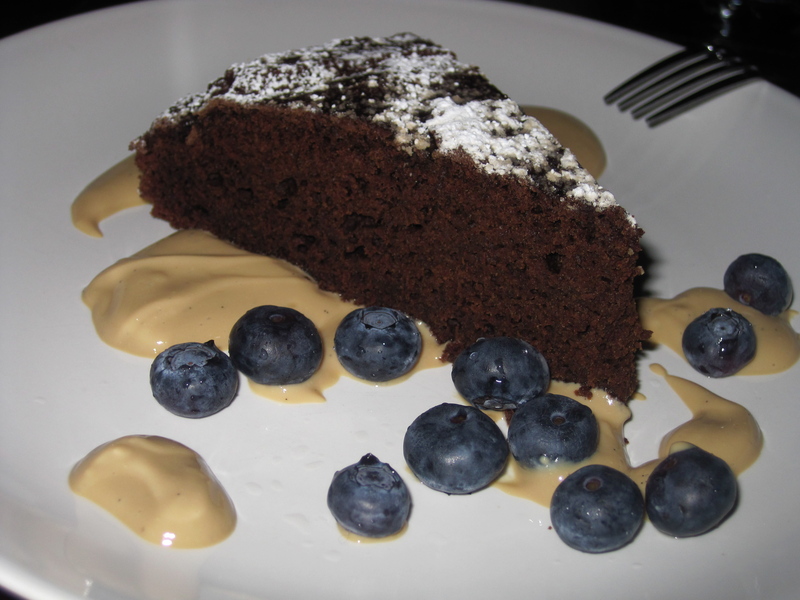 In a pastry class I took a few years ago I learned how to make chocolate mousse out of silken tofu. Figuring the texture was the first thing to worry about with a vegan sauce, I grabbed a container of the stuff from Whole Foods and figured I’d improv the rest. Okay, here’s the list of what eventually made it into my new food processor. It took a bit of trial-and-error-and-trial-more. A mess of ingredients, right? I mean, palm sugar and maple syrup and honey? 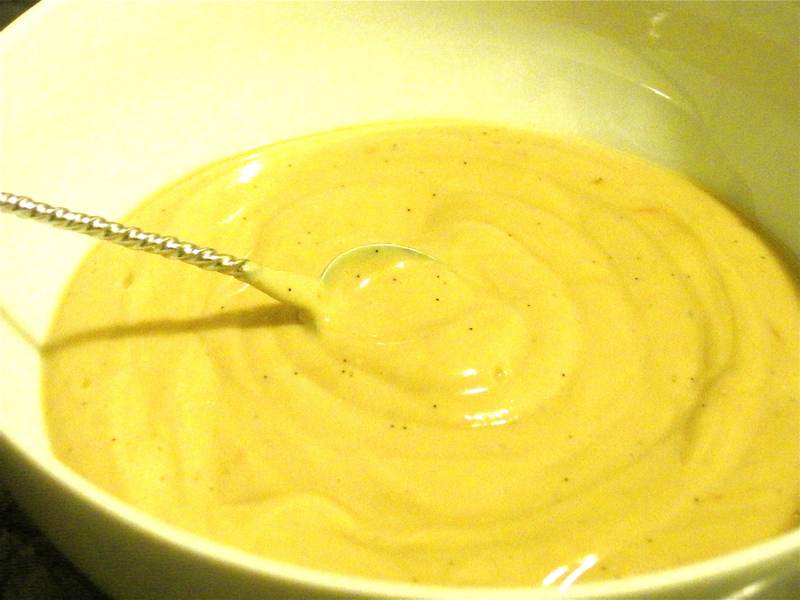 Originally I had meant to make a maple vanilla sauce. But I only had about 2 teaspoons of syrup left. Not wanting to use the dreaded agave, I thought maybe palm sugar would suffice. Nope. Adding more vanilla to the original teaspoon? Well, it was something. Adding honey for sweetness? A bit better. But the darned thing still tasted like tofu! So the sauce wouldn’t be a maple vanilla sauce. I was determined not to melt chocolate and throw it in. Then, brilliance struck (while Sigur Ros was playing, as often happens in my kitchen, for some reason. Icelandic magic, maybe). Coffee brings out the richness in chocolate and the depth of vanilla. Would it save the sauce? It did!! I now have a mildly sweet and richly complex sauce to drizzle over the chocolate cake. For friends who, by the way, have no food allergies or special dietary requests. I will probably reel from the amount of sugar in what I’ll be sampling – I just hope it’s enough for their taste buds to do a happy-dance. I don’t normally bake with bananas. My mother has a delectable recipe for banana bread, but these deliciously sweet fruits have been forbidden since hypoglycemia reared its ugly head. But sometimes opportunity is the mother of invention, and I inherited four very ripe bananas from a friend with little time to utilize them. The same person who passed them on was also a bit under the weather. Time to get baking! One thing I love about making muffins is how you can just sort of throw in whatever you have around to make them as simple or complex as your mood is flowing. I had some pecans around that were ready for toasting and was trying to use the rest of my agave syrup (I won’t be baking with it soon – more to come on that). Tossing stuff into a bowl with gusto, I’ve got a decent recipe going here. The challenge was using the agave syrup instead of sugar: in most muffin recipes, sugar and butter are beaten until fluffy so that the moisture of the banana doesn’t soup the batter. But with agave, which is liquid, there is no such dry and sweet combination. So I added cormeal, increased the amount of baking soda to give it a little extra lift, and threw in the pecans that I had toasted ever so slightly for some texture. The result? They came out light and fluffy while still being dense, and the cornmeal gave them a scrumptious, ever-so-slightly crumbly texture that I love. The amount of sweetness was perfect for me. Because I was staying with friends at the time I made these get-better muffins, my full flour-arsenal wasn’t at my fingertips, so I used Bob’s Red Mill all-purpose gluten-free flour mix. In a recipe with this complexity, it blended just dandily. As always with my recipes, you can always substitute the butter with butter flavored Earth Balance and the eggs with powdered egg replacer to make them vegan, gluten-free banana bread muffins. They may lack a little heft, but they’ll still be delicious. If you have raw nuts, spread them out in a single layer on a baking sheet and bake them while the oven preheats. Check on them regularly to make sure they don’t burn – this should take no longer than 10 minutes and they’ll brown quickly once brought to heat. I cannot take full credit for this glorious gluten-free-vegan brunch creation – many thanks go to Rae and Robbie for playing in the kitchen with me while I was paying Cincinnati a holiday visit. 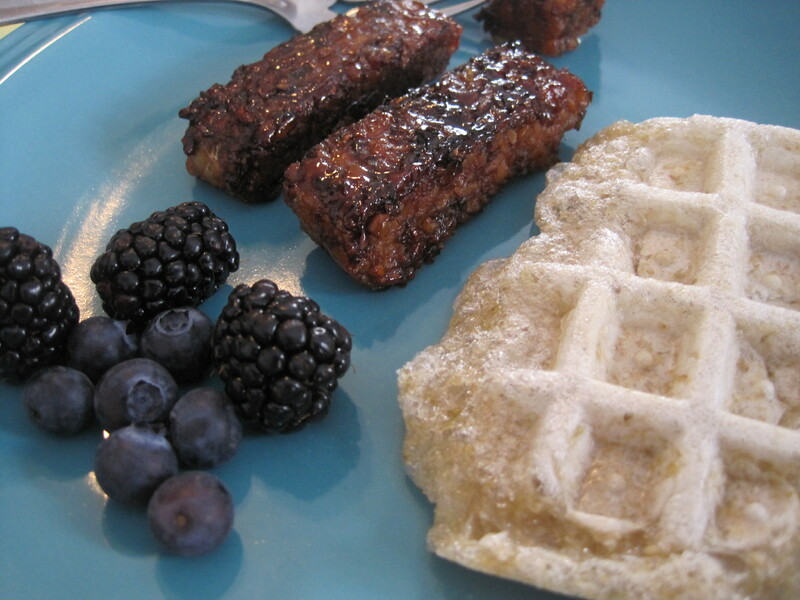 Armed with nothing but a waffle maker, frying pan and one spatula, we set out to coax tempeh into something that slightly resembled bacon and form gluten-free waffles from mochi. And the results were deliciously delicious! And yes, I truly mean that grammatically incorrect tasty bit of hyperbole. They were dusty delicious. They were amazing. They were phe-nom-en-al. I’ve heard that in Japan they’re starting to use the term “moffle” to refer to mochi waffles. I’ve never been a fan of Branjelina or romcoms, so I’ll take the extra sixteenth of a second to continue to type the two words out. What is Mochi? Mochi is glutinous sweet rice that is pounded into a paste and molded into a hard shape. Many Japanese traditional desserts utilize mochi is a base ingredient, and when dyed with bright greens and pinks add a bit of festivity to the simple dessert. I am not a particular fan of those forms of mochi, but LOVE the bricks you can buy and cook yourself. When mochi bakes it fills with air creating a beautiful crusty exterior that houses chewy goodness. I love to toast it, slice it and fill it with almond butter. Friends drop it into soup or grill it and douse it with tamari for a savory treat. 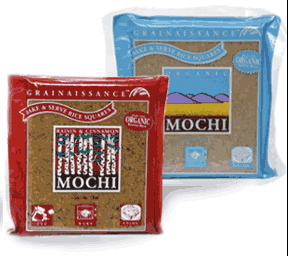 Nutritionally, plain mochi is made only with sweet rice and filtered water, making it easily digestible and naturally low in fat and calories. Despite being “glutinous”, mochi is GLUTEN-FREE, the term instead referring to it being “sticky”. Keep in mind that mochi waffles are not light and fluffy like wheat waffles, so indulge in a little creativity with your toppings. We went fairly simple with real maple syrup and brown rice syrup, plus some fresh black and blueberries. Nut butters add some protein (if you’re not accompanying your waffles with tempeh bacon), and provide a creamy kick. Choose your mochi. Grainassance brand is sold at most health food stores in several flavors, most commonly plain and cinnamon raisin. Either make great mochi waffles. Cut mochi into 16 pieces. 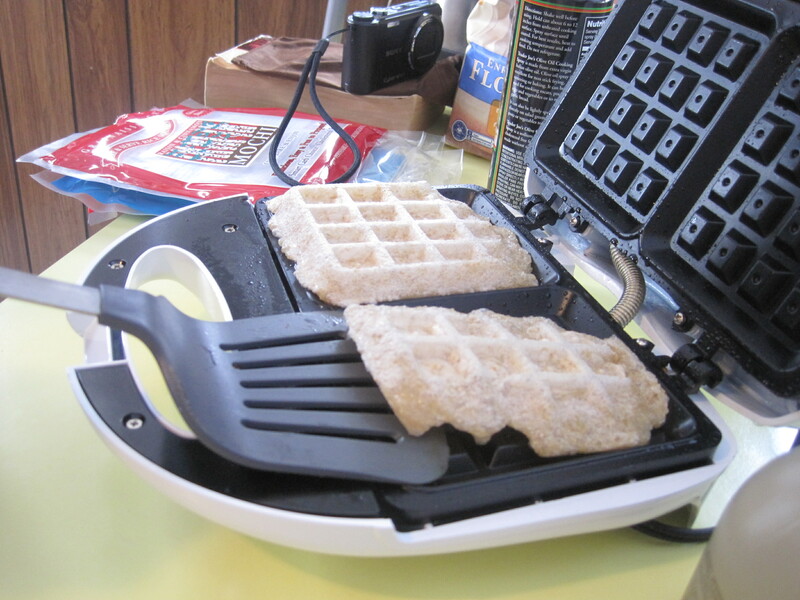 Spray waffle maker with non-stick cooking spray, or grease with butter or oil. For square waffles such as in the picture above, use 4 pieces of mochi evenly spaced. Close griddle and bake for approximately 4-6 minutes, until mochi is puffed and steamy. Rae is vegan and while I love tempeh I also love the crap out of meat, so it was an exciting challenge she gave me in making tempeh taste like bacon. Especially as we were dining in “Porkopolis”, the nickname lovingly given to Cincinnati for the copious amount of pork bred and consumed there. While I was unsure of succeeding in this task, especially in someone else’s kitchen, we were all pretty satisfied with the results. I tried to encapsulate the sweet and smokey aspects of bacon. And, once again, the recipe is shockingly easy. Note: make sure both your tempeh and tamari are marked gluten-free if you follow such a diet. Many tempeh’s are bulked up with grains to increase the flavor and nutritional content and therefore are not guaranteed to be free of gluten. And while tamari is noted for being the gluten-free version of soy sauce, some versions do contain gluten. Pick up one brick of tempeh, cut into 8 strips and place in a medium bowl. Pour 1/3 a cup of tamari and 1/4 cup maple syrup over tempeh, toss to marinate and let sit for about a half hour. Set a medium frying pan on medium-high heat and spray lightly with cooking spray. When hot, place tempeh in pan, reserving liquid to baste. Cook thoroughly, turning tempeh in quarter turns until all sides are brown, basting with reserved liquid with ever turn. Taste sauce and adjust syrup and tamari as needed. 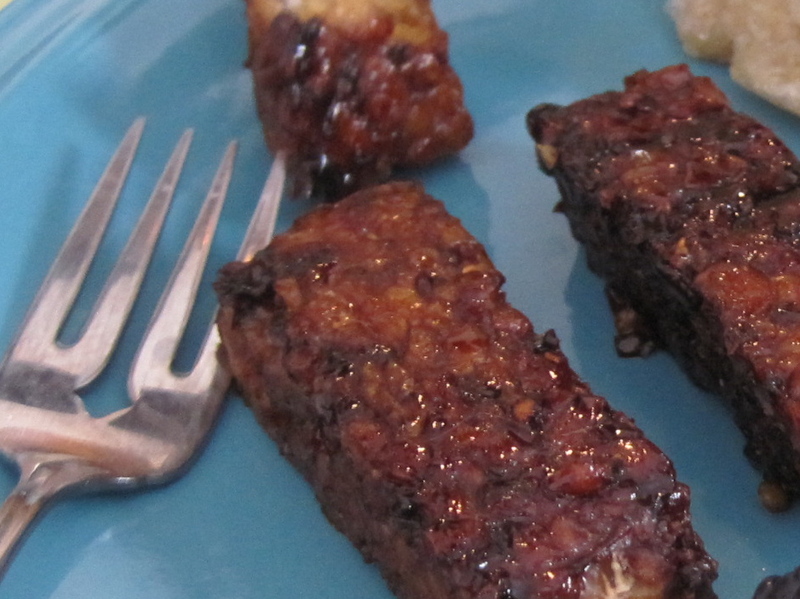 Tempeh is ready when the liquid has caramelized and tempeh is dark. Waffles are the new muffin. You heard it here first, Dusty Baker style. Last weekend I was bequeathed with a waffle iron, that I dutifully packed into my carry-on and brought back to NYC from Cincinnati (thanks, Rae!). This morning I had guests to prepare breakfast for, and was frustrated with my lack of muffin options – I had no nuts, berries, raisins, fruit, nothing to put into a muffin! I had thoroughly explored the gluten-free muffin world last year in Cincinnati, and now that trip inspired what will surely be one of many gluten-free waffle recipes to grace this site. I popped out all the flours I had open in the fridge, consulted classic waffle recipes, and got to work. 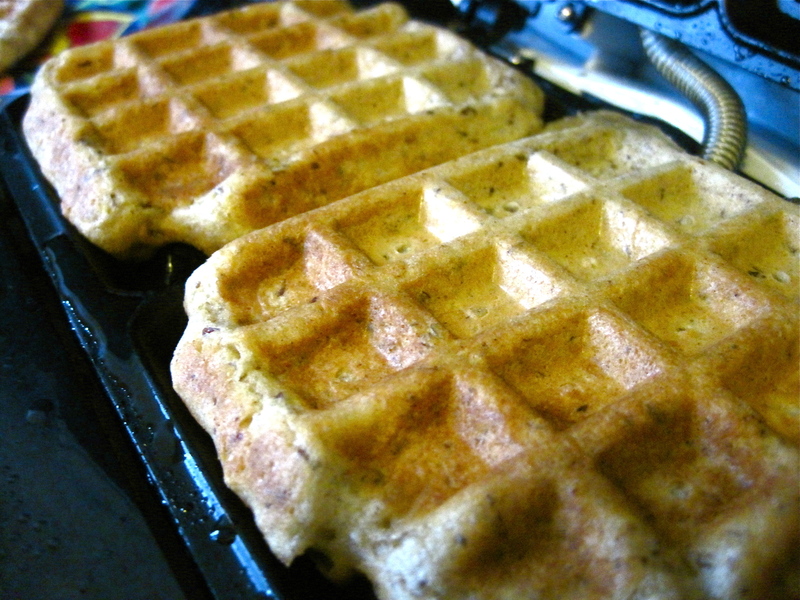 The result: these waffles are deliciously whole-grain and sweet because of the use of amaranth and quinoa flours. I used two different types of cinnamon to give them bite. And 6 tablespoons of butter gave a perfectly creamy balance to the grains. If you don’t have all of these ingredients, substitute with what you have. Cow’s or soy milk can be substituted for the almond milk, as can a soy/vegetable alternative to butter and egg replacer for the eggs easily makes them a gluten-free vegan waffle recipe that holds its own comparatively.